The Prelude: The plan was simple. Take our impressive juggling skills to Europe and make bank street performing. And we would have gotten away with it, if it hadn't been for those pesky kids! Walter:Walter first learned to juggle about 8 years ago. It is still unknown if it was due to bordom or if he was held at gunpoint and forced to learn, but nevertheless he is a complete addict now. He has recently been accepted to Circomedia (a contemporary circus arts school in Bristol England) and will be training there from Sept. 2002 until July 2004. His main goal in life is to open his own circus arts school. He is also interested in making the Humboldt Juggling Festival one of the biggest festivals in the world! Silas:Silas was on an olympic track to become the first American to win a gold in synchronized brain surgery, when a devastating sprain in his baby toe left him useless. Distraught over his misfortune, he found refuge in wine, women, and juggling, often at the same time. 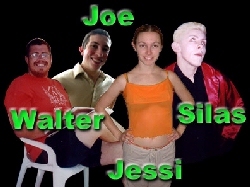 He first met Walter and Jessi after trying to break-in to their house using a juggling club as lockpick. Impressed by his resourcefulness, the two decided to drop the charges in exchange for joining their group. Silas is not a performer, but he'll play one on this trip. Similarly, he is not an acrobat, dancer, or clown. He does not like to scamper or frolic. He does not like to make people laugh, and he *hates* being the center of attention. And contrary to all reports, he is never mistaken for a younger, sexier David Bowie. Anything that runs counter to what has been stated thus far is surely the result of mass hysteria, caffeine-induced hallucinations, wish fulfillment, and/or the actions of his evil twins, of which he has two. In September of 2002, the juggling trio is violently ripped apart by a savage argument over the proper pronunciation of "croissant." Distraught and again alone, Silas starts across Europe as a traveling salesman hawking a miracle elixir promising eternal life. This becomes a short-lived success, and he is nearly violently ripped apart by frustrated octogenarians. Deciding that life in the fast lane isn't for him, he decides to pursue his childhood dream. In September of 2010 he opens up the world's first Ferret Ranch and Lazertag Superdome. His business is an overnight success, and so the next day he retires. In September of 2011, he marries a trio of russian Cirque Du Soleil contortionists: Anastasia, Svetlana, and Barb and moves to a beachside condo in Guam. Silas died September 8th, 2189 at the ripe age of 212. He is succeeded by his three wives, 24 children, and two ferrets. Jessi: Jessi has just discovered how much she really wants to run away and join the circus (or other like endenvors) this last year. She learned how to juggle from Walter March of 2001 and is quite proud of her progress. She can juggle four ball, three clubs, pass 7club, and feed two jugglers from on top of walters shoulders while he feeds them too. It sounds complicated but in the end it just looks damn neat. She has been dancing in her living room and in other less exotic places like theaters for most of her life. She recently got back into theater and more importantly physical theater. She's decided to forgo being a artist and teacher for a while and use her youth to persue a life of vagrancy in the circus arts world. This summer trip will be the most exciting thing she has done to date to accomplish that goal. She is both scared and thrilled. Joe: Joe never wrote a bio. Actually, I never really knew Joe until this trip. He was a surprise addition, we found him stored away in one of our bike boxes when we arrived in England. We considered simply dumping the box, Joe, bike, and all, into a nearby canal, but our conscience got the better of us. Actually, Jessi pointed out that if we were short on money, we could always sell him on the red light district when we got to Amsterdam. Thankfully (for Joe) his sense of humor and calm demeanor quickly endeared him to the group, and we proudly made him the fourth member of Fortune's Fools. A wise decision, as his nose balloon trick turned out to be one of the most succesful (and disgusting) aspects of our show.